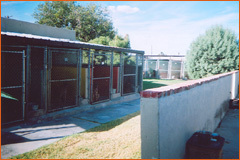 Our kennels are indoor/outdoor runs heated in the winter and air conditioned in the summer. The out door part is covered for shade and weather. Most kennels are for single dogs but we do have larger runs available for multiple dog families. 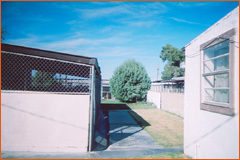 We have kennel viewing hours Mon-Fri 4-6pm. Kennel life can be stressful if a dog has never been boarded and the manner in which you leave your dog will determine how he/she will enjoy their stay. We like to make the transfer as seamless as possible, so they are happy and you are too. We feed Activa Performance from Valley Feeds. However, if you prefer to bring your own food we insist it must be in a water proof container with your dogs name on it. Shots All dogs must have proof of Rabies, DHLPP, Bordatella and some type of once a month flea and tick preventative. In case of emergency we do charge a $50.00 fee for opening after hours.